Points are scored by passing the ball through the basket from above; the team with more points at the end of the game wins. The ball can be advanced on the court by bouncing it (dribbling) or passing it between teammates. Disruptive physical contact (fouls) is not permitted and there are restrictions on how the ball can be handled. 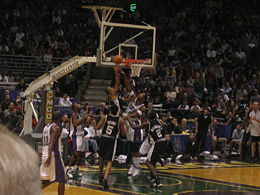 While competitive basketball is carefully regulated, numerous variations of basketball have developed for casual play, including half court games, where only one basket is used, three-on-three games (usually half court) or other games where less than five players per team are used, and shooting games such as "H-O-R-S-E," where two or more individuals attempt to match each others shots at the basket. In early December 1891, Dr. James Naismith, a Canadian physical education student and instructor at YMCA Training School (today, Springfield College) in Springfield, Massachusetts, United States, sought a vigorous indoor game to keep his students occupied and at proper levels of fitness during the long New England winters. After rejecting other ideas as either too rough or poorly suited to walled-in gymnasiums, he wrote the basic rules of basketball and nailed a peach basket onto a 10-foot elevated track. In contrast with modern basketball nets, this peach basket retained its bottom, so balls scored into the basket had to be poked out with a long dowel each time. A soccer ball was used to shoot goals. Whenever a person got the ball in the basket, they would give their team a point. Whichever team got the most points won the game. Naismith's handwritten diaries, discovered by his granddaughter in Spring 2006, indicate that he was nervous about the new game he had invented. His rules were derived from a Canadian children's game called, "Duck on a Rock." Naismith called the new game 'Basket Ball'. The first official basketball game was played in the YMCA gymnasium on January 20, 1892 with nine players, on a court just half the size of a present-day National Basketball Association (NBA) court. 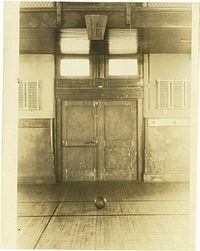 "Basket ball," the name suggested by one of Naismith's students, was popular from the beginning. Women's basketball began in 1892 at Smith College when Senda Berenson, a physical education teacher, modified Naismith's rules for women. Basketball's early adherents were dispatched to YMCAs throughout the United States, and it quickly spread through the United States and Canada. By 1895, it was well established at several women's high schools. While the YMCA was responsible for initially developing and spreading the game, within a decade it discouraged the new sport, as rough play and rowdy crowds began to detract from the YMCA's primary mission. However, other amateur sports clubs, colleges, and professional clubs quickly filled the void. In the years before World War I, the Amateur Athletic Union and the Intercollegiate Athletic Association (forerunner of the NCAA) vied for control over the rules for the game. Although there is no direct evidence as yet that the idea of basketball came from the ancient Mesoamerican ballgame, knowledge of that game had been available for at least 50 years prior to Naismith's creation in the writings of John Lloyd Stephens and Alexander von Humboldt. Stephen's works especially, which included drawings by Frederick Catherwood, were available at most educational institutions in the nineteenth century and also had wide popular circulation. Naismith and Berenson were instrumental in establishing college basketball. Naismith coached at University of Kansas for six years before handing the reins to renowned coach Phog Allen. Naismith's disciple Amos Alonzo Stagg brought basketball to the University of Chicago, while Adolph Rupp, a student of Naismith's at Kansas, enjoyed great success as coach at the University of Kentucky. In 1892, University of California and Miss Head's School, played the first women's inter-institutional game. Berenson's freshmen played the sophomore class in the first women's collegiate basketball game at Smith College, March 21, 1893. The same year, Mount Holyoke and Sophie Newcomb College (coached by Clara Gregory Baer) women began playing basketball. By 1895, the game had spread to colleges across the country, including Wellesley, Vassar and Bryn Mawr. The first intercollegiate women's game was on April 4, 1896. Stanford women played Berkeley, 9-on-9, ending in a 2-1 Stanford victory. In 1901, colleges, including the University of Chicago, Columbia University, Dartmouth College, University of Minnesota, the U.S. 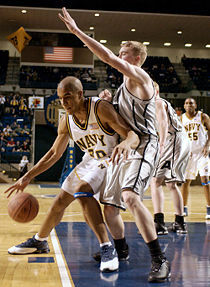 Naval Academy, the University of Utah and Yale University began sponsoring men's games. By 1910, frequent injuries on the men's courts prompted President Roosevelt to suggest that college basketball form a governing body. As a result, the Intercollegiate Athletic Association (IAA) was created. Teams multiplied throughout the 1920s. There were hundreds of men's professional basketball teams in towns and cities all over the United States and little organization of the professional game. Players jumped from team to team and teams played in armories and smoky dance halls. Leagues came and went. And barnstorming squads such as the Original Celtics and two all African American teams, the New York Renaissance ("Rens") and the Harlem Globetrotters played up to 200 games a year on their national tours. Women's basketball was more structured. In 1905, the National Women's Basketball Committee's Executive Committee on Basket Ball Rules was created by the American Physical Education Association. These rules called for six to nine players per team and 11 officials. The International Women's Sports Federation (1924) included a women's basketball competition. Thirty-seven women's high school varsity basketball or state tournaments were held by 1925. And in 1926, the Amateur Athletic Union backed the first NAIA national women's basketball championship, complete with men's rules. The first women's Amateur Athletic Union All-America team was chosen in 1929. Women's industrial leagues sprang up throughout the nation, producing famous athletes like Babe Didrikson of the Golden Cyclones and the All American Red Heads Team, who competed against men's teams, using men's rules. By 1938, the women's national championship changed from a three-court game to two-court game with six players per team. The first men's national championship tournament, the National Association of Intercollegiate Basketball tournament, which still exists as the National Association of Intercollegiate Athletics (NAIA) was organized in 1937. The first national championship for NCAA teams, the National Invitation Tournament (NIT) in New York, was organized in 1938; the NCAA Men's Division I Basketball Championship would begin one year later. Before widespread school district consolidation, most United States high schools were far smaller than their present day counterparts. During the first decades of the twentieth century, basketball quickly became the ideal interscholastic sport due to its modest equipment and personnel requirements. In the days before widespread television coverage of professional and college sports, the popularity of high school basketball was unrivaled in many parts of America. Today, virtually every high school in the United States fields a basketball team in varsity competition. Basketball's popularity remains high, both in rural areas where they carry the identification of the entire community, as well as at some larger schools known for their basketball teams where many players go on to participate at higher levels of competition after graduation. In the 2003–2004 season, 1,002,797 boys and girls represented their schools in interscholastic basketball competition, according to the National Federation of State High School Associations. The states of Illinois, Indiana and Kentucky are particularly well known for their residents' devotion to high school basketball, commonly called Hoosier Hysteria in Indiana; the critically acclaimed film Hoosiers shows high school basketball's depth of meaning to these rural communities. In 1946, the Basketball Association of America (BAA) was formed, organizing the top professional teams and leading to greater popularity of the professional game. The first game was played in Toronto, Canada between the Toronto Huskies and New York Knickerbockers on November 1, 1946. Three seasons later, in 1949, the BAA became the National Basketball Association (NBA). An upstart organization, the American Basketball Association, emerged in 1967 and briefly threatened the NBA's dominance until the rival leagues merged in 1976. Today, the NBA is the top professional basketball league in the world in terms of popularity, salaries, talent, and level of competition. The NBA has featured many famous players, including George Mikan, the first dominating "big man"; ball-handling wizard Bob Cousy and defensive genius Bill Russell of the Boston Celtics; Wilt Chamberlain, who originally played for the barnstorming Harlem Globetrotters; all-around stars Oscar Robertson and Jerry West; more recent big men Kareem Abdul-Jabbar and Karl Malone; playmaker John Stockton; crowd-pleasing forward Julius Erving; and the three players who many credit with ushering the professional game to its highest level of popularity: Larry Bird, Earvin "Magic" Johnson, and Michael Jordan. The NBA-backed Women's National Basketball Association (WNBA) began in 1996. Though it had an insecure opening season, several marquee players (Sheryl Swoopes, Lisa Leslie and Sue Bird among others) helped the league's popularity and level of competition. 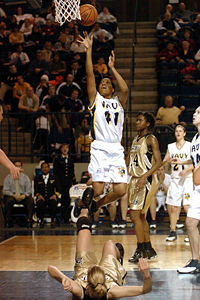 Other professional women's basketball leagues in the United States, such as the American Basketball League (1996-1998), have folded in part because of the popularity of the WNBA. In 2001, the NBA formed a developmental league, the NBDL. The league currently has 8 teams, but added seven more for the 2006-2007 season. Basketball was first included in the Olympic Games in 1936, although a demonstration tournament was held in 1904. This competition has usually been dominated by the United States, whose team has won all but three titles, the first loss in a controversial final game in Munich in 1972 against the Soviet Union. In 1950 the first FIBA World Championship for men was held in Argentina. Three years later, the first FIBA World Championship for Women was held in Chile. Women's basketball was added to the Olympics in 1976, with teams such as Brazil and Australia women's national basketball team|Australia]] rivaling the American squads. Throughout the years, basketball has evolved from a sport only played in the United States to one played and viewed worldwide. There are myriads of leagues internationally that play some form of basketball. For example, there are approximately 215 teams supporting their regional area on the globe in the FIBA championships. From Europe to Asia, from the Americas to Africa to Oceania, the FIBA championships are a global congregation of the best players in the world, and in and of itself, a grand tribute to the sport of basketball. Teams that are participating in this tournament are ranked from 1-83, with the United States ranked number 1. Basketball's exponential growth curve is evident with the entrance of teams representing Afghanistan, Nigeria, China, Israel, Egypt, the Bahamas, Bangladesh, Angola, Argentina, Austria, Brazil, British Virgin Islands, Cambodia, Canada, Chile, Costa Rica, Colombia, Cook Islands, El Salvador, Ethiopia, England, Germany, Greece, Grenada, Kenya, Romania, Russia, Singapore, Switzerland, Turkey, Tahiti, Thailand, Venezuela, India and the Virgin Islands. They, in fact, are only a few of the 215 teams entered in the contest, but the global variation is astounding. What is even more shocking is the fact that each and every one of these countries and teams entered in the contest have their own league, similar to the United States' National Basketball Association. Basketball is arguably the most diverse sport, and its international influence is prevalent in the National Basketball Association itself, as more and more NBA teams are reaching into the international talent pool to address their needs. Since 1950, when the FIBA World Championships were founded, the United States has won the most medals, 10, followed by Germany and Yugoslavia with eight. Other teams that have enjoyed olympic success in this global basketball tournament include Brazil, Russia, Argentina, Chile, Spain, Greece, Croatia, Philippines, and Germany. Many of the players representing their geographic area are usually players that play for a team in that country. For example, the Australian team consists of players from the Sydney Kings, one of the teams in Australia. In addition, basketball in their respective countries, has flourished. For example, the CBA, Chinese Basketball Association, is a parallel to the National Basketball Association in the United States. Since 1995, they are attracting more viewers and have produced talented players, the most popular being the Houston Rocket's center, Yao Ming. More and more teams are trying to implement NBA rules in their own leagues to produce a higher viewer-rating. There are other major leagues worldwide in addition to the NBA. The ULEB is the Union of the European Leagues of Basketball. One of these are the BBL, the British Basketball League. They include the Birmingham Panthers, Sheffield Sharks, Chester Jets, Everton Tigers, Guildford Heat, Leicester Riders, London Capital, London United, Milton Keynes, Newcastle Eagles, Plymouth Raiders, Scottish Rocks, and the Worcester Wolves. The ACB (Asociación de Clubes de Baloncesto) is the major league for Spain. The remainder of leagues that form the ULEB consist of, Lithuania's LKL (Lietuvos Krepsinio Lyga), Greece's HEBA (Hellenic Basketball Clubs Association), Switzerland's LNBA (Ligue Nationale de Basket ), France's LNB (Ligue Nationale de Basketball ), Portugal's LCB ( Liga dos Clubes de Basquetebol ), Germany's BBL (Basketball Bundesliga), Belgium's BLB (Basketball League Belgium ), Poland's PLK (Polskiej Liga Koszykówki S.A), Italy's LEGA (Società Pallacanestro Serie A ), Israel's BSL (Basketball Superleague), Netherland's FEB (Federatie Eredivisie Basketballclubs), Slovenia's ABA (NLB League ABA), and the Czech Republic's ALK (Asociace M. Prvoligovych Klubu). Games are played in four quarters of 10 (international) or 12 minutes (NBA). College games use two 20-minute halves while most high school games use eight minute quarters. Fifteen minutes are allowed for a half-time break, and two minutes are allowed at the other breaks. Overtime periods are five minutes long. Teams exchange baskets for the second half. The time allowed is actual playing time; the clock is stopped while the play is not active. Therefore, games generally take much longer to complete than the allotted game time, typically about two hours. The game is controlled by the officials consisting of the referee ("crew chief" in the NBA), one or two more refs and the table officials. For both college and the NBA there are a total of three referees on the court. The table officials are responsible for keeping track of each teams scoring, timekeeping, individual and team fouls, player substitutions, and the shot clock. The only essential equipment in basketball is the basketball and the court: a flat, rectangular surface with baskets at opposite ends. Competitive levels require the use of more equipment such as clocks, scoresheets, scoreboards, alternating possession arrows, and whistle-operated stop-clock systems. The ball must stay within the court; the last team to touch the ball before it travels out of bounds forfeits possession. The ball-handler may not move both feet without dribbling, known as traveling, nor may he dribble with both hands or catch the ball in between dribbles, a violation called "double dribbling." A player's hand cannot be under the ball while dribbling; doing so is known as carrying the ball, or more technically, a "carry-over." A team, once having established ball control in the front half of the court, may not return the ball to the backcourt. If so, the team violating this rule will be charged with a back-court violation, and the ball will be returned to the opposition. The ball may not be kicked nor struck with the fist. A violation of these rules results in loss of possession, or, if committed by the defense, a reset of the shot clock. There are limits imposed on the time taken before progressing the ball past halfway (8 seconds in international and NBA; 10 seconds in NCAA and high school), before attempting a shot (24 seconds in the NBA; 35 seconds in NCAA), holding the ball while closely guarded (5 seconds), and remaining in the restricted area (the lane) (3 seconds). These rules are designed to promote more offense. No player may interfere with the basket or ball on its downward flight to the basket, or while it is on the rim (or, in the NBA, while it is directly above the basket), a violation known as goaltending. If a defensive player goaltends, the attempted shot is considered to have been successful. If a teammate of the shooter goaltends, the basket is cancelled and play continues with the defensive team being given possession. A player or coach who shows poor sportsmanship, for instance, by arguing with a referee or by fighting with another player, can be charged with a technical foul. The penalty involves free throws and varies between leagues. Repeated incidents can result in ejection (disqualification). Blatant fouls with excessive contact that are not an attempt to play the ball are called unsportsmanlike fouls (or flagrant fouls in the NBA) and incur a harsher penalty; in some rare cases a disqualifying foul will require the player to leave the playing area. If a team surpasses a preset limit of team fouls in a given period (quarter or half)—four for NBA and international games—the opposing team is awarded one or two free throws on all subsequent fouls for that period, the number depending on the league. 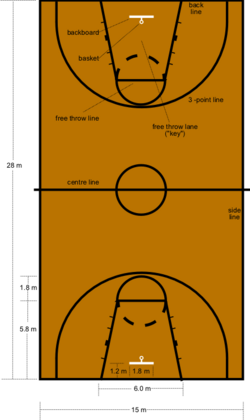 In the United States college game if a team surpasses seven fouls in the half the opposing team is awarded a one-and-one free throw (make the first you have a chance at a second). If a team surpasses 10 fouls in the half the opposing team is awarded two free throws on all subsequent fouls for the half. A player who commits five fouls, including technical fouls, in one game (six in some professional leagues, including the NBA) is not allowed to participate for the rest of the game, and is described as having "fouled out." The number of free throws awarded increases with the number of fouls committed. Initially, one shot is awarded, but after a certain number of additional fouls are committed the opposing team may receive (a) one shot with a chance for a second shot if the first shot is made, called shooting "one-and-one," or (b) two shots. If a team misses the first shot (or "front end") of a one-and-one situation, the opposing team may reclaim possession of the ball and continue play. If a team misses the first shot of a two-shot situation, the opposing team must wait for the completion of the second shot before attempting to reclaim possession of the ball and continuing play. 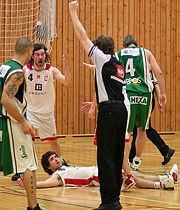 If a player is fouled while attempting a shot and the shot is successful, typically the player will be awarded one additional free throw for one point. 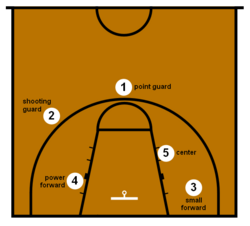 In combination with a regular shot, this is called a "three-point play" because of the basket made at the time of the foul (2 points) and the additional free throw (1 point). Four-point plays, while rare, can also occur. point guard: usually the fastest player on the team, organizes the team's offense by controlling the ball and making sure that it gets to the right player at the right time. This is the player that orchestrates the offense emphasized by the coach. The player should be positioned facing the basket with feet about shoulder-width apart, knees slightly bent, and back straight. The player holds the ball to rest in the dominant hand's fingertips (the shooting arm) slightly above the head, with the other hand on the side of the ball. To aim the ball, the player's elbow should be aligned vertically, with the forearm facing the direction of the basket. The ball is shot by bending and extending the knees and extending the shooting arm to become straight; the ball rolls off the finger tips while the wrist completes a full downward flex motion. When the shooting arm is stationary for a moment after the ball is released, it is known as a follow-through; it is incorporated to maintain accuracy. Generally, the non-shooting arm is used only to guide the shot, not to power it. A shot that misses both the rim and the backboard completely is referred to as an air ball. A particularly bad shot, or one that only hits the backboard, is called a "brick." Another type of pass is the bounce pass. Here, the passer bounces the ball crisply about two-thirds of the way from his own chest to the receiver. The ball strikes the court and bounces up toward the receiver. The bounce pass takes longer to complete than the chest pass, but it is also harder for the opposing team to intercept. Thus, players often use the bounce pass in crowded moments, or to pass around a defender. The crucial aspect of any good pass is its ability to get to its intended receiver without any risks of the ball being intercepted. Good passers can pass the ball with great accuracy and touch and know exactly where each of their teammates like to receive the ball. A special way of doing this is passing the ball without looking at the receiving teammate. This is called a no-look pass. Good dribblers (or "ball handlers") tend to bounce the ball low to the ground, reducing the travel from the floor to the hand, making it more difficult for the defender to "steal" the ball. Additionally, good ball handlers frequently dribble behind their backs, between their legs, and change hands and directions of the dribble. This method of dribbling, called the "crossover" makes the dribbler's intentions less predictable and more difficult to defend. A skilled player can dribble without watching the ball, using the dribbling motion or peripheral vision to keep track of the ball's location. By not having to focus on the ball, a player can look for teammates or scoring opportunities, as well as avoid the danger of someone stealing the ball from him. At the professional level, most male players are above 1.90 meters (6 ft 3 in) and most women above 1.70 meters (5 ft 7 in). Guards, for whom physical coordination and ball-handling skills are crucial, tend to be the smallest players. Almost all forwards in the men's pro leagues are 2 meters (6 ft 6 in) or taller. Most centers are over 2.1 meters (6 ft 10 in) tall. According to a survey given to all NBA teams, the average height of all NBA players is just under 6 ft 7 in (2.01 m), with the average weight being close to 222 lbs (101 kg). The tallest players ever in the NBA were Manute Bol and Gheorghe Mureşan, who were both 2.31 m (7 ft 7 in) tall. The tallest current NBA player is Yao Ming, who stands at 2.29 m (7 ft 6 in). The shortest player ever to play in the NBA is Muggsy Bogues at 1.60 meters (5 ft 3 in). Other short players have thrived at the pro level. Anthony "Spud" Webb was just 5 feet 7 inches (1.70 m) tall, but had a 42-inch (1.07 m) vertical leap, giving him significant height when jumping. The shortest player in the NBA today is Earl Boykins at 5 feet 5 inches (1.65 m). While shorter players are often not very good at defending against shooting, their ability to navigate quickly through crowded areas of the court and steal the ball by reaching low are a valuable asset on any team. 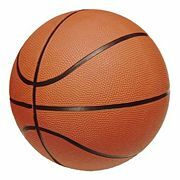 Variations of basketball are activities based on the game of basketball, using common basketball skills and equipment (primarily the ball and basket). Some variations are only superficial rule changes, while others are distinct games with varying degrees of basketball influences. Other variations include children's games, contests or activities meant to help players reinforce skills. Wheelchair basketball is played on specially designed wheelchairs for the physically impaired. The world governing body of wheelchair basketball is the International Wheelchair Basketball Federation  (IWBF). Water basketball, played in a swimming pool, merges basketball and water polo rules. Beach basketball is played in a circular court with no backboard on the goal, no out-of-bounds rule with the ball movement to be done via passes or 2 1/2 steps, as dribbling is not allowed. There are many variations as well played in informal settings without referees or strict rules. Perhaps the single most common variation is the half court game. Only one basket is used, and the ball must be "cleared"—passed or dribbled outside the half-court or three-point line—each time possession of the ball changes from one team to the other. Half-court games require less cardiovascular stamina, since players need not run back and forth a full court. Half-court games also raise the number of players that can use a court, an important benefit when many players want to play. A popular version of the half-court game is 21. Two-point shots count as two points and shots from behind the three-point line count three. A player who makes a basket is awarded up to three extra free throws (or unlimited if you are playing "all day"), worth the usual one point. When a shot is missed, if one of the other players tips the ball in with two while it is in the air, the score of the player who missed the shot goes back to zero, or if they have surpassed 13, their score goes back to 13. This is called a "tip." If a missed shot is "tipped" in, but the player who tips it in only uses one hand, then the player who shot it is out of the game and has to catch an air ball to get back in. The first player to reach exactly 21 points wins. If they go over, their score goes back to 13. Other variations include streetball and one-on-one; a variation in which two players will use only a small section of the court (often no more than a half of a court) and compete to play the ball into a single hoop. Such games tend to emphasize individual dribbling and ball stealing skills over shooting and team play. Enter away message text here. The game of basketball borders around the values of discipline, respect for the opponent, and selflessness. It is a team sport: one player cannot achieve the ultimate success, the NBA championship, but one player can bring together a group of players, and ignite that will to win, which can lead the team to their goal. Basketball, for the average fan, is just a game. Then there are those for whom basketball is a love like none other. It usually starts on the driveway, shooting hoops for hours and hours, or on the blacktop with friends. Either way, basketball finds a way to enter into the soul and become a passion for life. Bill Bradley, a former player of the New York Knicks wrote in his, Values of the Game, "When I was a teenager, alone in the high school gym for hours, the repetition of shooting, shot after shot, became a kind of ritual for me. The seams and the grain of the leather ball had to feel a certain way. My fingertips went right to the grooves and told me it felt right." Basketball on television influenced the younger population immensely. Bradley said, "When I practiced alone, I often conjured up the wider world of basketball. Maybe I had just seen the Los Angeles Lakers play on television the day before; I'd try to remember a particular move that Laker forward Elgin Baylor had made, then imitate it. I would simulate the whole game in my mind, including the spiel of the announcer. "Five seconds left, four seconds, three, Bradley dribbles right in heavy traffic, jumps, shoots—good at the buzzer!" All over the world, basketball fans put themselves in the shoes of their favorite stars and imagined themselves making big shots. A dream that some special players, like Bradley, fulfilled. Passion for the game is great, but along with it, there needs to be the competitive will to succeed. Bradley wrote, "Chicago Bulls forward Dennis Rodman isn't everyone's cup of tea, but I admire the determination he shows on the floor. He's turned rebounding into an art form." ↑ Newly found documents shed light on basketball's birth, The Associated Press, 2006. Retrieved March 15, 2018. ↑ IWBF, IWBF. Retrieved March 15, 2018. ↑ Beach Basketball, Beachbasketball.com web site. Retrieved March 15, 2018. National Basketball Association. 2001. Official Rules of the National Basketball Association. Retrieved March 15, 2018. Reimer, Anthony. FIBA vs North American Rules Comparison, 2016. Retrieved March 15, 2018. Bonsor, Kevin. How Basketball Works: Who's Who. HowStuffWorks. Retrieved March 15, 2018.